Keep children busy with our many early science, manipulation, and arts & crafts workshops and activities. Making cleanup fun, now there's a challenge everyone will enjoy! Here are a few helpful suggestions to try with children. They will make moans a thing of the past! Give children a shopping bag with handles. Ask them to collect all the toys on the floor. Next, they "deliver" them to the correct location. You can ask children to clean up objects one colour at a time. Urge children to clean up faster by telling them a storm is coming. If they do not clean up quickly, the storm will blow all the toys away! Everything will disappear like magic! Have a cleanup countdown. Children each pick up five toys, then four toys and three toys, and so on. You may choose to play a song. Challenge children to clean up all the toys before the end of the song. Gather all the toys in the centre of the room. When you give the signal, children pick up as many toys as possible, put them in the right place, then run back to get more. Go! Dissect one or two flowers to show children the various parts. Name the parts and have children repeat the names which will surely be new additions to their vocabulary. Organize a container with items we normally find at the flower shop. Include fabric or plastic flowers, vases, ribbon, adhesive tape, labels, scissors, order forms, a cash register, a telephone, wrapping paper, pretend money, etc. Children will invent a variety of scenarios. The pictures may be used as a memory game or to spark a conversation with the group. Use them to decorate the daycare or a specific thematic corner. 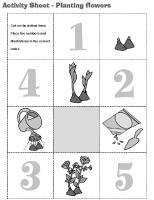 (Open picture game-Flowers) Print, laminate, and store in a "Ziploc" bag or in your thematic bins. Different sizes of empty flower pots are perfect for creating towers. Your workbench and tools can be used to build flower boxes! Games involving gears and assembly can be used to create flowers. Decorate the area with pictures of flowers. They will inspire children's creativity. Cardboard, tissue paper, empty egg cartons, recycled material, and imagination...the only ingredients required for making beautiful flowers! Provide pipe cleaners, straws, and Popsicle sticks for stems. Petals from fabric flowers or dried flowers may be used for collages. Plastic pots can be painted then used to display the flowers children make at the end of the theme. Stencils related to flowers or gardening. 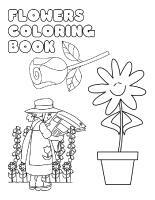 Coloring pages with flowers of all kinds. Drawings which can be covered with glue and seeds (flower seeds or other kinds). Organize a flower shop with ribbons, transparent paper for wrapping, fabric flowers, a few unbreakable vases, and pictures or posters of real flowers. You can also create a gardening area with various gardening accessories (toys), watering cans, empty flower pots, etc. You may add gardening gloves, a sun hat, a short hose, knee protectors, etc. Memory game with educatall flower illustrations. Homemade puzzles made with pictures of flowers or puzzles you have on hand which can be added to the theme. Pictures of flowers and empty medicine bottles which contain seeds and a small picture of the corresponding flower. Children associate the two. Smelling game using cotton balls in containers. You can use flower scents or other scents children are familiar with. Pictures of flowers which children can sort by colour. Modeling dough and artificial flowers children can plant into the dough. Also provide cookie cutters shaped like flowers. You can perfume modeling dough with rose oil. Books about flowers, gardens, and planting. Gardening magazines...parents most likely have some from past years. Flower pictures to decorate walls (old calendars). 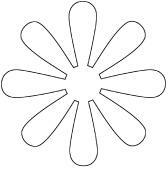 Dot to dot flowers for tracing. Small games in which children find the errors in flower scenes. 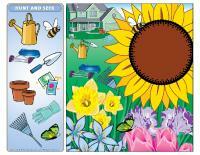 Various activity sheets with flowers. Games using educatall word flashcards. A psychomotor obstacle course. Have children hold a flower or a flower pot throughout the activity. Stretching activity. Imitate a flower growing from the seed to flowering time. Musical flower game (or other similar activities). Simply glue different colours of flowers to the floor, the possibilities are endless. Large container filled with dirt. Provide gardening tools and small plastic flower pots. Children will enjoy digging, filling, emptying, etc. Container filled with dirt for planting a mini garden indoors. It can be brought outdoors later on to pursue the experiment. Flowers or plants which need to be transplanted. An experiment which demonstrates how a flower changes colour when placed in water containing food colouring. Conceive your very own miniature greenhouse and observe the changes which take place over several days or even several weeks. Find comestible flowers (available in some supermarkets). Visit your local florist or gardening center. Tell children they are flower seeds in the ground. They must curl up in a ball on the floor. Pretend that it is starting to rain. They remain curled up in a ball but wiggle and move around. The seed then begins to grow out of the ground. Children lift up their head and upper body. The sun shines and the flowers grow and grow. Children can stand up slowly. Finally, the flowers bloom. Children stand tall and stretch out their arms. Suddenly, the wind begins to blow. Children sway from side to side keeping their feet firmly on the ground. Fill a container with soil. Add gardening tools, plastic flowers, and an empty watering can (to avoid a mess). Children will enjoy planting their flowers and caring for them. Stand in a circle with the children. Select two or three kinds of flowers. A few children can be daisies, others can be roses, and a final group can be tulips. Say "Daisies move!" Children who are daisies quickly change places. Continue the game, naming the other types of flowers. Divide children into two groups. Have each group sit at a table. Deposit a large piece of paper and crayons on each table. Play fast-paced music. The goal is to draw a field full of flowers before the song ends. Cut out tiny construction paper flowers and place them on the floor throughout the daycare. Give each child a butterfly which is the same colour as one of the flowers. This game is played much like musical chairs but without competition. Children walk around while the music plays. When it stops, each "butterfly" must find the flower which is the same colour. Children may exchange their butterflies prior to the music starting up again. (For younger children, use only two colours of flowers and butterflies and add more when they are able to discriminate with ease). Use garden furniture to create a maze. Children move about the flower garden. Place obstacles on their path. You may tie a jumping rope to two chairs and have children crawl beneath it and place a bucket of water on a chair and have children crawl under it like a worm. Tie a plastic rose to a child's waist. The other players try to grab the rose. When a player succeeds, he ties it to his waist. The winner of the game is the first player to steal the rose three times. Take a walk outside and admire flowers or visit your local flower shop. 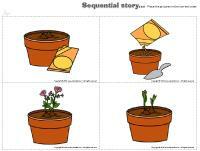 (Open sequential story-Flowers) Print, laminate, and cut out the pictures. Have children place the pictures in order to recreate the story. 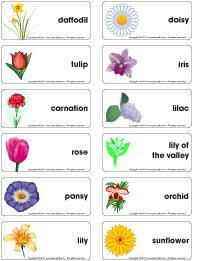 (Open word flashcards-Flowers) Have children stand or sit in a circle and place the word flashcards in the center. Give each child a flower name (rose, daisy, tulip, daffodil, etc.) 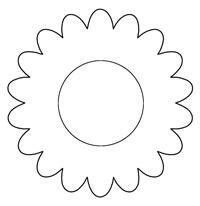 When you name a flower, the child who was assigned this flower goes to the center of the circle and searches for the card which represents his flower. (Open Hunt and seek-Flowers) Print and laminate. Children pick cards and find the items in the scene. 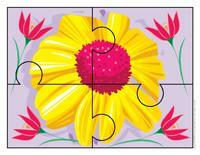 (Open puzzle-Flower) Print, laminate, and cut out the pieces. Children position the pieces to recreate the picture. Use the theme's picture game. (Open picture game-Flowers) Place the cards in front of the group. Stand at the opposite end of the room. Say "(Child's name) pick a daisy for me!" The child finds the correct picture and brings it to you. The child stays at your side. Continue until everyone has had a turn. Distribute small cards with flowers on them. There must be two copies of each flower. Children search for the child who has the matching flower. Together, they try to identify the flower's name. Play music. They will be dance partners for one song. When the song is over, redistribute the cards and start over! Have children look at various flower books for inspiration. Have them draw their favourite flowers on a sheet of paper. Once they are done, they can present their drawing to their friends and explain their choice. Soak cotton balls in perfumed oil. Place them in empty margarine containers with holes in the lid. Secure the lids with adhesive tape. If you do not have oil on hand, use candles or soaps which have flower scents. You may also show them pictures of flowers for an association game. Find two plants which look alike. Place one in the sun and water it regularly. Place the second plant in an area which does not receive sunlight and never water it. Children observe the difference and identify plants' needs. Give each child a "Ziploc" bag and have them place cotton balls inside. Have them place bean seeds on the cotton balls. They can add a small quantity of water. Hang the bags in a window so they get plenty of sunlight. In a few days, children will observe changes. Variation 1: You can do the same thing using small yogurt containers and soil. Leave the containers on a window sill and remember to water them. Variation 2: You may use a Styrofoam glass. Have children decorate the glass with eyes, a nose, and a mouth. Use grass seeds. When the grass grows, the glass will look like a character with hair that really grows! You will need three white carnations and three glasses. Pour water into one glass. Use water tinted with food colouring in the other two glasses. Place one flower in each glass and wait for the result. The flowers in the glasses with coloured water will become coloured too! You will need different types of flowers: one cardboard flower, a tissue paper flower, a flower drawn on a pebble, a real flower, and a flower made with modeling dough. Deposit each flower in a container filled with water and observe whether they sink or float. Have a comestible flower tasting. They can be found in certain supermarkets. 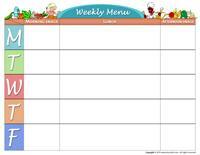 Variation: Provide children with cucumbers, carrots, and celery. Children create flower designs with the vegetables. When they are satisfied with their creation, they may eat it. 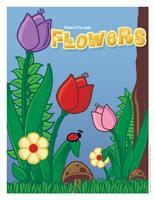 Purchase the Magic Flower Nuudles Kit available on the educatall online store. The kit contains two flower pots, Nuudles in assorted colours, and flower seeds. Create Magic Nuudle flowers in the pots then transform them into real flowers using the flower seeds. Simply place the seeds in the pots and plant in soil. Water the flowers regularly. Since the Nuudles are biodegradable they will promote germination. (Open models-Flower) Print and use only the smaller models. Let children colour the flowers as they wish. Make a small hole in the center of each flower. Give each child a string and have them thread their flowers on it. Cut several circles from multicoloured tissue paper. 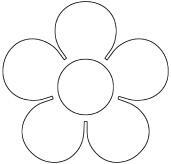 To make a flower, use six circles. Tie them together with a pipe cleaner. Pinch the center and separate the layers. Spray with a few drops of perfume. Prepare bouquets using a variety of flowers (tissue paper, fabric, plastic, Kleenex, etc.) Create a centerpiece by pressing flowers into florist foam or by placing them in a vase. You may also simply use a ball of modeling dough to hold your flowers upright. Your centerpiece is perfect for dressing up a table for a special occasion such as Mother's Day. Pick flowers you grow in your garden or which grow wild in fields. Tie them in bunches. Hang them upside down in a dry, obscure area for one to three weeks. Once the flowers are dry, children can conceive beautiful artwork with them. They can glue their dried flowers to a paper plate and paint the contour. Once dry, attach a fastener to the back. Make tulips using empty egg carton sections. Have children paint each section a different colour. Use pipe cleaners to make stems and plant them in a piece of green florist foam. Sculpt various flower shapes on potato halves. Hang a large piece of paper on the wall. If you wish, you can use brown grocery bags. Simply cut them and glue them together. Offer children several vibrant colours. Have them make flower prints on the paper. Make flowers using doilies and glue them to the paper among the printed flowers. (Open craft-sunflower) Print a copy for each child. Cover the sunflower with glue then have children cover it with seeds. You will need one drinkable yogurt container per child ("Yop"). Completely cover the outside of the container with glue. Children roll it in sand. When it is dry, they may paint their vase. (Open models-Flowers) Print. Let children cut out their flowers. Provide craft material they can use to decorate their flowers. Tissue paper, felt, markers, cotton balls, pipe cleaners for stems, and sparkles are good options. Display children's flowers throughout the daycare. Provide children with construction paper. Children tear the paper into small pieces they can use to create flowers. They can glue their small pieces onto another piece of construction paper. 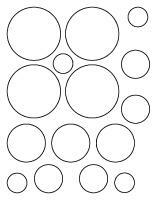 (Open models-circles) Print and have children cut out the circles. Give each child a paper plate. Cut out two holes for the eyes. 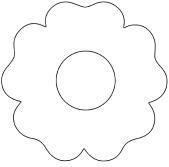 Glue the cut out circles all the way around the contour of the plate so it looks like a flower. Let children decorate their flower as they wish. Glue a long stick to the back of the plate to represent the stem. Children may also use the stick to hold the mask in front of their face. (Open models-circles) Trace the circle models onto yellow and orange construction paper. The large circle can be on yellow paper and the smaller one on orange paper or vice versa. Children cut out the circles and glue the smaller one onto the large one. Next, have them cut out strips of paper for the sun's rays. They can glue the strips around the outside of the sun. Finally, they may draw a face. (Open models-Flowers) Print several copies of the model. Children colour and decorate the flowers. Have them cut a strip of construction paper to fit around their head. Have them glue their flowers all the way around their hat. 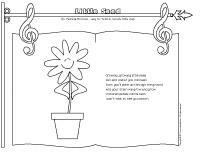 (Open coloring pages theme-Flowers) Print for each child.